The Rise of Tiffany Hwang Mi-Young – from “Mushroom” to “Angel”. A short discourse on how our favourite “eye smiles” girl rose from “mushroom” to “angelic” Tiffany. Born on August 1st 1989 in California, USA, the youngest of 3 siblings, who can forget the day our favourite “mushroom” appeared on the fans’ “radar screen” as the adorable “eye smiles” girl of the Korean Pop group “Girls Generation” ?!! From flubbing her song lines to missing her dance steps to being too “direct” to her Korean elders, Tiffany (Stephanie) did almost everything that guaranteed a quick and ignominious exit from the K-Pop scene! Yet, here she is, 4 years post-debut, still making the occasional mistake, but now having a HUGE “Fanytastic” fan-base, 2 solo singles under her proverbial belt, many, many commercial endorsements, a VERY SUCCESSFUL musical career with 8 other “beautiful girls” and the LOVE of millions around the world: fans, non-fans, new fans, old and young, male and female! So, what’s her “secret”? Is it the fact that she can give an “eye smile” that will literally “melt” the heart and resolve of the toughest of opponents? Is it the fact that she is “angelically” naturally beautiful? Is it because of her extremely cute behaviour? Her height? Her hair? NO, I personally believe she’s where she is now because she is able, with The Good Lord’s help, to personify the concept of Agape (or selfless) Love to all and sundry. Many a time in her short, but, oh so eventful, musical/acting/hosting career, Tiffany has shown a resolve and determination to do her very best in all that she has been tasked to do, sometimes even at the expense of her overall health! Yet, no where in all this does she seek to succeed at the expense of others. In fact, the very opposite is true; Tiffany will Always seek to help when she sees a need that arises! Such behaviour is so atypical of people in the “cut-throat” entertainment industry and is surely, I believe, a God-given trait to His children, of which, I am happy to say, Tiffany is one of. I’ll always remember the posted fan account of how she helped a so-called “anti” when the latter had an accident in front of the SME building in Korea. Alternatively, how about another fan account where she so kindly aided another 2 first-time Thai “fans” to get their manicures performed in a Korean nail shop, when the former 2 visited while she was there having her nails done prior to a concert engagement ? Tiffany could have acted the diva in both cases and ignored (or worse, gloated over the misfortune of the “anti” in the first example) the ones in need. After all, she is a celebrity! But, she did not and, in fact, went the “other way” to help out the afflicted parties to the very best of her abilities. Tiffany puts into practice what she believes in and has been taught to believe in as a child of the Living God, and that is her ultimate charm and the secret to her success and popularity. How else can one explain the “hue and cry” that arose in the K-Pop industry, and even the media, when she injured her knee during the “Hoot” promotion tours, forcing SM Entertainment to eventually cut-short the whole “exercise”?!! When Tiffany eventually recovered after about a month or so of recuperation, the news was so significant that it was even reported in the media in Japan, both print and audio-visual! SM Entertainment even modified the dance choreography of some of the “Girls” hit songs to accommodate her recently healed knee! The world became a much brighter place when Tiffany finally returned on-stage with her “angelic” beauty and her irresistible “eye smiles”! Yet, in spite of all this, Tiffany still remained as humble and as helpful as ever, ever ready to flash a smile or give a laugh to cheer someone up, whether her “unnies” in SNSD or a fanboy/fangirl. Herein lay her charm: Tiffany is indeed the personification of LOVE in word and deed. Tiffany is my role model, she's an angel without wings to us, Fanytastic. God bless her, god loves her. 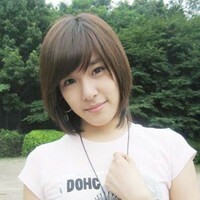 I LOVE TIFFANY HWANG !